@DamoRC measurements are 44 inches long and 41 inches wide; including wing span. no twist to the fusleloge, just the bottom wing was thinner than I liked, even though the regular nieuport bottom wing was thin, but I didn't think it would hold up to wind, so I used left over foam scraps and made them stronger. the main wing that is the top is nice and hefty, with spars in it as Josh showed, plus the holes for electronics. Okay - you should be good based on the dimensions you posted. C-pack is a good motor for that size and assuming you have not built her too heavy (for the motor or the wing). Any digital kitchen scale (don't get a bathroom scale) will do - you can probably pick them up at walmart for about $10. thanks, it will be weighted later this evening and will get back to you on the weight. 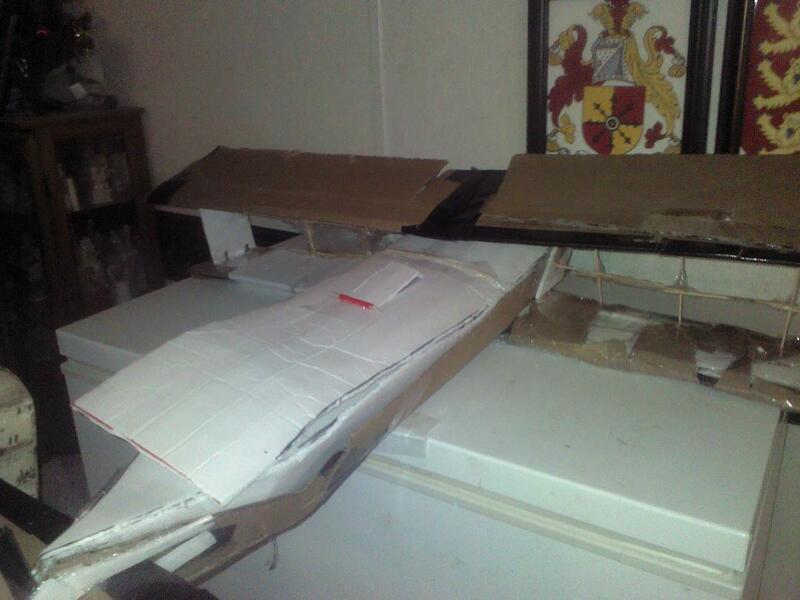 @DamoRC how does one build a removeable hood on a plane with the popsicle sticks that Andre built in the DIY Goblin? Wow, the plane is 3 feet 8 inches long and the wings are 3 feet 5 inches. wow. he forgot the scale, but will get one to weight the plane, he got balsa wood dowl rods, I created racing hood pins for the top that covers the plane, I took thin scraps of foam board, bent it in half, taken the new low temperature glue gun and gorrilla glue sticks, glued the tip of the folded foam board to make the holder for the rods, then glued the holder into place, then made the hood pin holes, and stuck the rods into the holder, glued the bottom of the rods into place, made also a hing on the final piece of foam board that seals up the plane, so now, the rods stay in place and have a hood that lifts off them. Way the angle of the rods are, should hold the hood on while in flight. Then to make the X spars, will glue two rods together and tape them with box tape strengthen them, then install them. If I have enough rods, will try to make the dual guns that are under the top wing, then the single gun on the top wing. It looks like you may be getting kind of heavy. Keep in mind, the heavier it is the more difficult it will be to fly. I know you don't have a scale yet, but if it gets to be more than 3 lbs without electronics you will likely have some difficulty getting it off the ground. Agreed. As soon as you get the scales post the weight. Also probably worth your while calculating the wing loading (weight of the plane in ounces divided by the area of the wings in square feet) - will give some indication as to how well it will fly. Yeah will do, only thing I've put on last night while it stormed was the second wing brace that goes on the sides of the fuseloge that gives stability to the top wing, and the two rods making the hood pins, plus two more to create the hing. Other than that, waiting for the scale to weight the plane and then the bottom wing. Top wing will be the heavier I believe, since it will be rigged up with elevator controls, while the bottom is just there, no electronics. The dowl rods my dad got are same size and shape as the bbq skewers used, so not much weight, got the low temp glue gun, so lot less glue too, a tiny dab, boom, done. wondering how to make the cockpit of the nieuport, how do u make the stick move inside the cockpit, hook it to the same servo controlling elevator and rudder? You would probably need separate servos for the stick, one for the pitch and one for the roll. I would recommend finding the smallest possible servos as you won't need much torque and they add weight but don't help it fly. @JTarmstr take a look at this build too, it is braced and ready for the electronics, this is the Nieuport 24. this one we are trying to find a digital kitchen scale to weight it to see what powerpack we need. This should help with fabricating a fuselage and the best ways to make it smooth and symmetrical. So now moving on to the wing, I only see two problems 1 is the size relative to the body. and 2 is the spars/braces. The spars in particular seem a bit strange, by the looks of it they are a bit small and close together and would cause a ton of drag. what I would do is I would use either foam or craft sticks, and build 2 rows of spars to a side, each row containing two spars so there were four total. And remember, we all learn somewhere, when I built my first mustang I had to scrap the fuselage once and rebuild the tail completely. Also I am not the most experienced in building airplanes, while I have built several FT scratchbuilds, I am just now starting to design my own. I hope this helps and best of luck with the two bi-planes, I think the Nieuport 24 needs a C pack if kept at its current size. Yeah, that is what I am planning if the Flite Test store gets more in. Thanks on the info about the other biplane and best of luck on your design, tag me in it, so I can keep up to date on your build. Ok so one way to deal with this is to use a 3 or 4 foot straight edge, and some quick math then mark the center on the wing. I have printed two different sets of FT plans and it actually makes separates it into pages then you tape/glue it back together and go off of that, just look for the plans marked "Tiled" those are the right ones.